Although not precisely a bicycle enthusiast and certainly not an expert rider, I must admit that it must be a thrill moving around Barcelona on a bike. 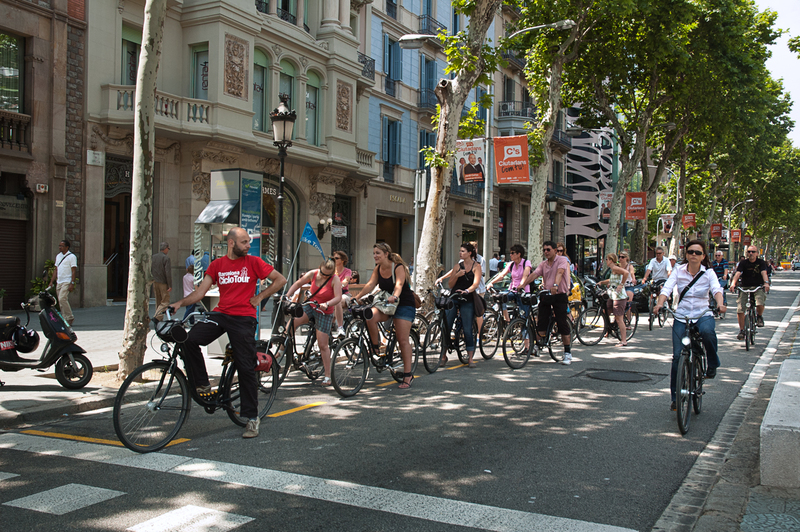 The more bicycle friendly the city gets the more frequent it is to find groups of riders exploring not only the small alleys of the old part of town but also big arteries like Passeig de Gracia (picture). There are several companies providing this guided tour services in Barcelona. You can easily see the name of the agency on the guide's T-shirt (Barcelona Ciclo Tours), but of course you have a great selection where to choose from. Here is a good list of bike rentals in Barcelona. A great idea as long it isn't too hot! I do like just wandering about though on foot with a camera. Funniest bIker I ever saw was on the DiagOnal, he was stark naked! Barcelona is an amazing city to cycle through.....very bike friendly compared to other cities. I explored loads of places on the bike. I rode from the zoo up to the arc de triumph then continued riding up and and ended at Avinguda Diagonal then explored Diagonal Mar. Then explored the forum and rode along the sea front. Before I knew where I was in Badelona. It was a great ride out (I never ride at home!!) and the traffic was never an issue. The trees provided a lot of shade too. I recommend anybody to get on a bike and ride, particularly along the sea front. It's lovely. Now it will be harder for you to find a naked buddy on a bike. They are going to be fined. They will charge you 300 euros even for not wearing your T-shirt in the city.